On behalf of the staff and myself, I would like to welcome you to our ibis Styles Brussels Centre Stéphanie. Relax in our modern well-designed rooms for an affordable price. Enjoy our breakfast buffet and stay connected via our free WiFi. You will quickly feel at home at ibis. Brussels offers a harmonious blend of history, culture and modernity. ibis Styles Brussels Centre Stéphanie is a modern hotel in the centre of Brussels. This hotel is ideally suited for both city breaks and long business stays because of its central location. Place Stéphanie, the Avenue Louise shopping area, the Royal Palace and several European Union institutions are all within walking distance. 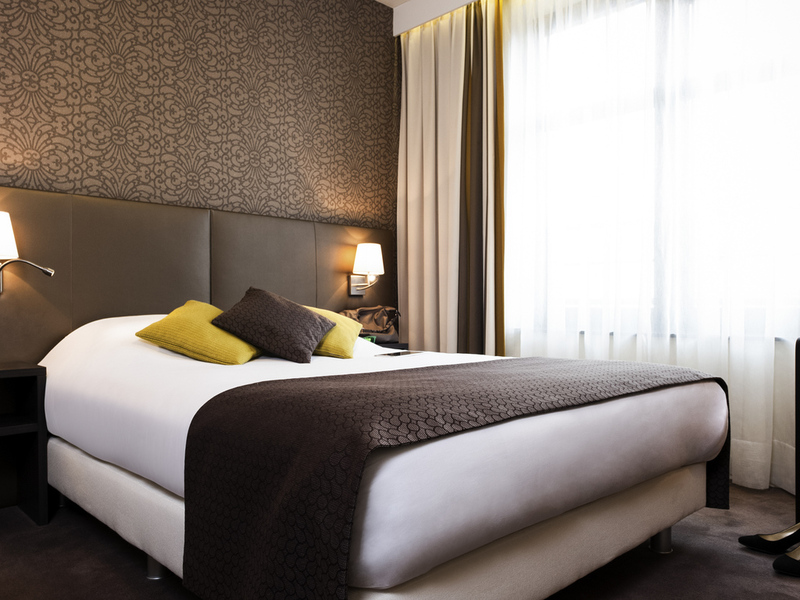 The ibis Styles Brussels Centre Stéphanie is within walking distance from the Horta Museum. The surrounding parks, such as the Cinquantenaire Park, Park van Vorst and the Tenbosch Park are eminently suited for leisurely walks. Visit the iconic attractions of Brussels, such as Manneken Pis, the Atomium and Brussels Grand Place. Have a look at mesmerizing art in the Royal Museums of Fine Arts. Or go taste some local specialties in one of the many cafés in the city centre. Design accommodation with free Breakfast and free WiFi, individual safe, micro wave, refrigerator, hair-dryer and flat screen TV. Standard rooms all have a double bed and a bathroom with a shower. The spacious suites also have a small seating area. I did not receive proper information concerning my request about the room. Also cleaning was a slight issue in the beginning but was taken care of after the first night. Initial room provided had a horrible smell . Changed room without problem. Comfortable room. Nice breakfast and easy checkout. Staying at this hotel was comfortable and relaxing. I had a great time at ibis Styles Brussels Centre Stephanie. Clean room, friendly staff and above all, excellent location. A brief but pleasant stay in the hotel. Very efficient staff on arrival and departure. Great quality for the value. Nice and helpful staff. Very good breakfast. Location is perfect.. lots of restaurants around. Location is good, breakfast is ok. Just front desk staff could be more efficient, i.e. - at check-in I was charged a bigger amount. I came down next day, they said yes, we noticed, ok we will reimburse. They could have called me as soon as they noticed. - There was a strong smell in my bathroom, impossible to stay there and I had to keep the door always locked. I approached reception with that problem. The answer was: &quot;I am sorry, I cannot do anything, because housekeeping has already left, and if I move you to another room, no one will clean this one, and we will sell one room less&quot;. (which was impolite and unprofessional way to handle the problem!) - my mother arrived very late at night (4am), all doors were locked, no one opened for her, so I had to go down to open the door for her - before check-out I approached front desk to ask specifically about my invoices: I made two reservations with different rates in purpose - to have two separate invoices. And I warned about that before check out. In 15 minutes when I checked out the receptionist printed me one invoice with both stays - opposite of what I needed and asked. I asked her to change and give me two invoices corresponding to my reservations. She said it is impossible because she already checked me out. I didn't feel like arguing and explaining anything anymore. Comfortable stay with nice breakfast. Great Service. Best value for money in the center of Brussels. Very comfortable. Great service as always. Friendly, smiling and helpful staff! Convenient location. Great value for money. Limited bells and whistles but then affordable price as well. Nice decent breakfast. WiFi in the room was very poor, hence the overall satisfaction of 8. Otherwise if the WiFi was good, then the rating was a definite 9 if not a 10. Also maybe need to have better water drinking cups inside the room. The ones provided are too thin and fragile. Also maybe a roll of normal tissue papers will be useful. All in all a great hotel for business as well as tourism travelers. Recommended hands down. Room was nice and quiet. The breakfast was better than in my previous stay. Very comfortable and clean room. Staff are friendly and responsive to help guests. Hotel is conveniently placed within the city and tram station that links with the metro stations. Nice sized room. Bright and clean toilet and batch. Good Belgian breakfast. Satisfied with my stay. Found this hotel online (through a general hotel booking server) and it was a good choice: conveniently located (in a pleasant part of the city close to the centre and the Midi station), with a spacious, clean, comfortable and well-equipped room, and a great breakfast. The only downside was variable wifi access, bu that didn't cause any big problems.